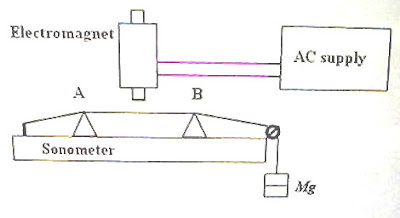 (b) (i) By suspending a suitable mass M, the steel wire in the sonometer is kept under tension T (= Mg). 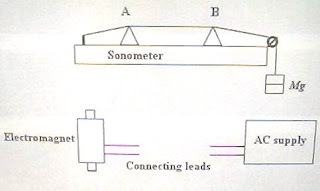 The electromagnet energized by the AC source is held above the steel wire segment AB in the sonometer. The wire oscillates because of the periodic attraction by the electromagnet. The length of the wire segment AB is adjusted by moving the knife edge A or B of the sonometer so that the wire segment is at resonance. This condition is indicated by the maximum amplitude of vibration of the wire segment, which can be conveniently judged by the maximum flutter of a small paper rider placed at the middle of the wire. The minimum length ℓ of the wire segment for attaining the resonance condition is measured using a metre scale. (ii) The frequency of vibration of the sonometer wire segment of length ℓ in the sth mode is (s/2ℓ)√(T/m) where T is the tension and m is the linear density of the wire. In the fundamental mode, s = 1. Therefore, the frequency of vibration of the sonometer wire segment = (1/2ℓ)√(T/m). (iii) Since the steel wire is attracted towards the electromagnet during the negative as well as positive peak of the alternating current flowing through the electromagnet, the frequency of vibration of the wire is twice the frequency of the AC. Therefore, frequency of the AC = (1/4ℓ)√(T/m). 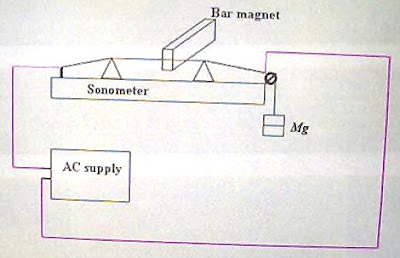 (i) The current carrying wire of the sonometer is located in the magnetic field produced by the bar magnet and hence it will experience magnetic forces. Since the current is alternating, the force is periodic and the wire will vibrate. Keeping the wire under a suitable tension T1 (= M1g), the length of the wire segment AB is adjusted by moving the knife edge A or B of the sonometer so that resonance is attained. The minimum length of the wire segment ℓ1 (corresponding to the fundamental mode of vibration) is measured. The frequency of vibration of the wire is (1/2ℓ1 )√(T1/μ). (ii) The current carrying brass wire is located in the magnetic field of the bar magnet and hence feels a magnetic force. The wire is pulled up during one half cycle of AC and pushed down during the next half cycle since the direction of the current in the wire changes. This means that the frequency of vibration of the wire is the same as that of the AC passing through the wire. Therefore, frequency of AC = (1/2ℓ1 )√(T1/μ).